Although Waz E James has been making fine music in his Australian homeland for a number of years, it wasn’t really until his 2009 release ‘Watermelon’ that he started to get some international promotion, mainly in the U.S. This drive for increased recognition will surely gain further momentum when his impressive brand new album ‘Noisy Trucks’ starts to get some airplay in its target markets. The album is pure ‘Americana from down under’ with a heavily influenced Texas feel about it. This is hardly surprising as its recording was split between James’s home city of Melbourne and the town of Brenham, Texas, probably the choice of ex-Flying Burrito Brothers band member, John Beland who produced the fourteen track album. Without wishing the originality of James’s style to be dismissed, there was definitely an element of acclaimed Texas musician Ryan Bingham within the earthy vocal style and a country/rock/blues tinged sound to the music. This is not deemed a criticism as Bingham is a fine performer and there’s definitely room in the crowded alt-country market for a fine exponent of this sound, of which James clearly is. James undertakes the writing tasks on all but one of the albums tracks, reaching deep into his creative mind and heart to cover a diverse range of subjects. There’s reference to the traditional country angst of consoling your losses with drink in the song ‘Hair of the Dog’, a track that has also featured on some of his earlier releases. Other subjects tackled include loving a flawed person in the up-tempo number ‘Car Wreck’, the Australian indigenous population in ‘Ruby’ and the usual topic of the futility of war covered in ‘Shiloh Baghdad’. The sounds created by his four piece band start off fairly mellow with the album’s title track ‘Noisy Trucks’, also the record’s opener which contrasts with the driving rhythm sound of ‘All Night Long’ and the rock infused numbers ‘All I Ever Want’ and ‘Hell for Leather’. There was also a sprinkling of the traditional country sound with a dose of lap steel and dobra on ‘Nothing I Can Say’ and mandolin on the fast moving ‘Headlights’. Perhaps the finest songs on the album are ‘Angels’ with its accordion accompaniment and infectious chorus and the solitary cover song on the record, the Fred Eaglesmith written ‘Alcohol and Pills’ which is a journey through the history of the demons that have affected and ultimately conquered some of America’s music greats. This arrangement stands alongside the versions of its writer, Todd Snider and Texas honky tonk band, Two Tons of Steel and perfectly sets this hour long album up for its fine closer, the roots- swampy number ‘River Boat Queen’. 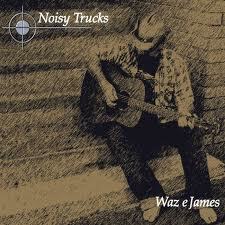 Waz E James has produced an impressive solid album that wouldn’t be out of place alongside the more vaunted names in alt-country and Americana music and maybe in the future he will come to the UK to further promote his craftsmanship.